And one point should be noted that if you regularly track these things then you will surely be able to maximize the growth rate of your business. But it takes too much time while calculating these things manually. So you must think about using some payment analytics software. Through them, you can easily perform all of those tasks. Yet there are hundreds of these kinds of tools all over the web & choosing one out of many is a tough task. That’s why I’ve mentioned some of the best PayPal & Stripe analytics software which you must think about using. What Will You Really Find in These Stripe Analytics Software? 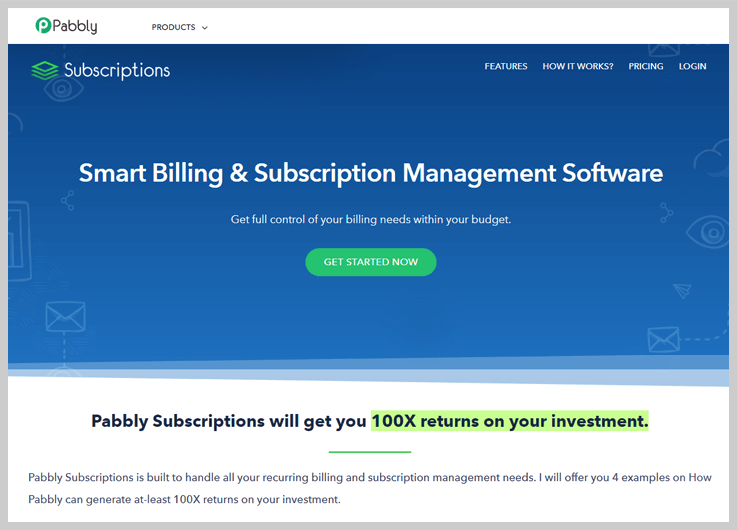 All the software listed here will help you handle MRR (monthly recurring revenue), ARR (average revenue per user), LTV (lifetime value), churn rate, net revenues, refunds, and a lot more. Stripe reporting & analytics is not at all an easy task, but with the software listed below, it becomes just a few click job. Moreover, these software allows you to create, manage, and analyze, customer details, plans, products, invoices, reports, etc. So, without any wait lets’ get started. Pabbly Subscriptions allows you have full control over recurring bills and subscription payments. Through it, you can collect an unlimited number of payments from your customers. Payments received through Stripe can be handled with ease as various metrics like customer lifetime value, refunds, MRR, active subscription & customers related details can be analyzed. My personal recommendation is with Pabbly Subscriptions, WHY? Unlike other payment analytics software and subscription management solutions, it has got no monthly charge. Just $5 for monthly access to all services. No transaction fee, No processing charges, no extra penny. Plus, you get deep insights about subscriptions, customers, net revenue, MRR and all transactions. Starter Plan:- Through this plan, you will be able to access & test all the features of this tool at just $5/m, you can manage almost 50 customers with so much ease. Rookie Plan:- Through this plan, you will be able to collect an UNLIMITED number of payments from 1000 customers. All you have to do is to pay $29/m. Pro Plan:- The Pro plan costs around $59/m for unlimited customers & their payments. Advance Plan:- In the Advance plan, you will get to use some features like custom domain, fully customizable checkout page, client portal (upcoming), etc. For all of them, you have to pay $99/m. Number of Subscriptions, Products, Plans, Coupons, Transactions = UNLIMITED. Cost per transaction & N% of revenue = $0, where ‘N’ is a number which starts from 0 to an uncountable number. It offers 25+ global currencies. So if you have international clients then you can easily collect payments from them. Also, you will never worry about losing any overseas client. Sales analytics is a major functionality with which Total Sales, New Subscriptions, Refunds, Cancelled Subscriptions, etc can be analyzed. Helps you deal with payments received from multiple payment gateways like PayPal and Stripe. With PayWhril recurring payments and subscription details like bill payments, annualized run rate, plan performance can be managed from a user-friendly dashboard. It simplifies online payments done through Stripe, gives you deep inside of each transaction, auto schedule payments, and charges recurring payments. You also get API for easy integration and you can deliver custom designed emails to the customers. Starter Plan:- This is a free plan which supports only Stripe payment gateway and only charges 3% processing. PRO Plan:- This plan will cost you $49 and will allow you to collect payments through Stripe, Braintree, Authorize.net and Spreedly Vault gateways. Additional 2% processing fee is also charged. PLUS Plan:- Monthly cost of this plan is $149 and it charges 1% as the processing fees. It supports Stripe, Braintree, Authorize.net, and Spreedly Vault payment gateways. ULTIMATE Plan:- Plan cost is $249, it comes with various advanced features and facilities. Plus, 0.5% is also collected for processing. ENTERPRISE Plan:- For pricing and other details related to this plan, you have to contact the sales team of PayWhirl. 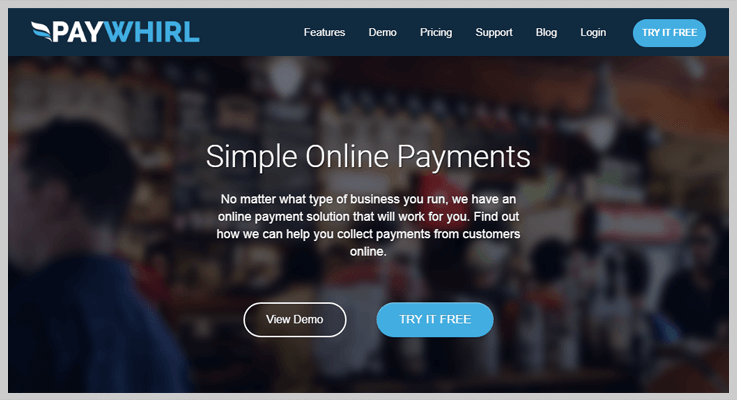 PayWhril allows integration with Shopify, Google Analytics, AdWords, MailChimp, Stripe, PayPal, Zapier, etc. Get each & every customer related details like lifetime value (LTV), monitor revenue by location, customer churn and more. You can create plans to collect payments on daily, weekly, monthly, and yearly basis. This subscription analytics software is dedicatedly designed for users who want to deal with Stripe payments without any hassle. FirstOfficer provides you weekly reports via emails, allows you to invite team members, helps you import non-Stripe payments, and do cohort retention which allows you to break user into groups as well. Hobby:- With this plan you can handle up to 250 customers details just by paying a cost of $29 per month. Startup:- This plan is for those who hold around 1000 customers and want to have weekly reports, Cohort Retention, etc. It will cost you $79 for a month along with various services. Professional:- $149 is the monthly price which is been charged for this plan with which you are allowed to have 2500 customer details on board with additional features and facilities. Business:- This is the top-end plan which is priced around $249 a month for 5000 customers. It comes loaded with facilities like weekly reports, import non-Stripe payments, Cohort Retention, CSV exports, etc. Generates weekly reports through which you can have a clear idea about the revenue, collections and other details of your business. Easy access over various metrics like Monthly Recurring Revenue (MRR), Annual Recurring Revenue (ARR), New MRR, Lost MRR, Discounts, Refunds, etc. 128-bit SSL connection is provided which is absolutely safe and secured to handle confidential customer details. 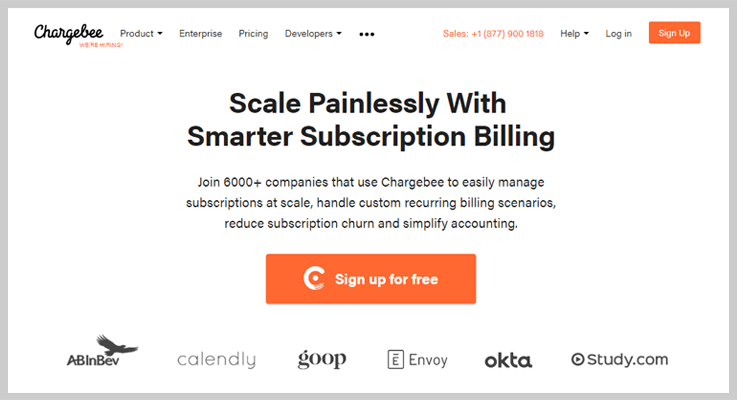 Chargebee has an easy to use dashboard with which you can add plans, create products, manage payment through different payment gateways like PayPal, Stripe and more. This payment data analytics tool allows you to create email notifications, hosted pages and invoices in different languages. Go Plan:- For this plan you have to pay $99 and additional 0.5% of the revenue if the provided limit of $25,000 is been exceeded. It offers 3 users access, tax reports, payment gateway, PayPal, ACH, email notifications and dunning as well. Rise Plan:- With this plan you get 10 users access, unlimited payment gateways option, SaaS metrics, salesforce, etc at a cost of $299 a month. It allows you to handle $50k revenue in a month if the limit is crossed the 0.6% of the exceeded revenue will be charged. Scale Plan:- $599 a month is the base price of this top end plan with which you get 25 users, advance invoices, multiple payment modes, priority phone support and much more. It permits you to handle $75k revenue in a month. 0.9% of the excess will be added. Straight from the dashboard you can have a look at all the essential details related to MRR & CMRR, refunds, transaction trends, signups & activations, churn, etc. You can track transaction history, and this system auto creates invoices for your customers. Variety of payment gateways like PayPal, Stripe, Authorize.Net, Braintree are fully supported by this subscription management service. 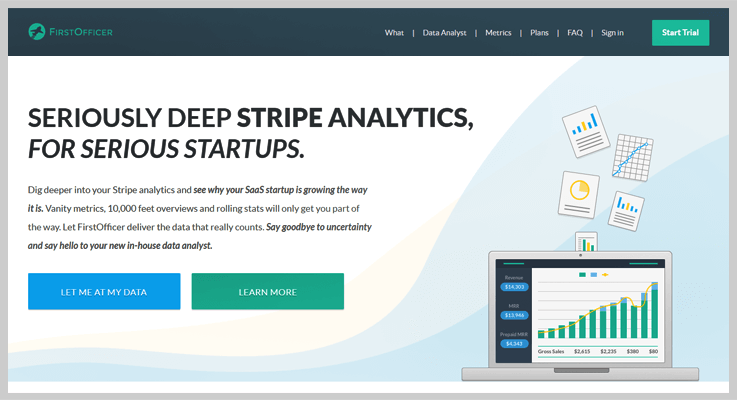 One of the best Stripe analytics tool that benefits you by reducing the churn rate of your business. You can effectively perform dunning management with Metricsco as it allows you to send dunning details to customers via emails, messages, and phone calls as well. Supports Stripe, Braintree, Paysafe, JetPay. 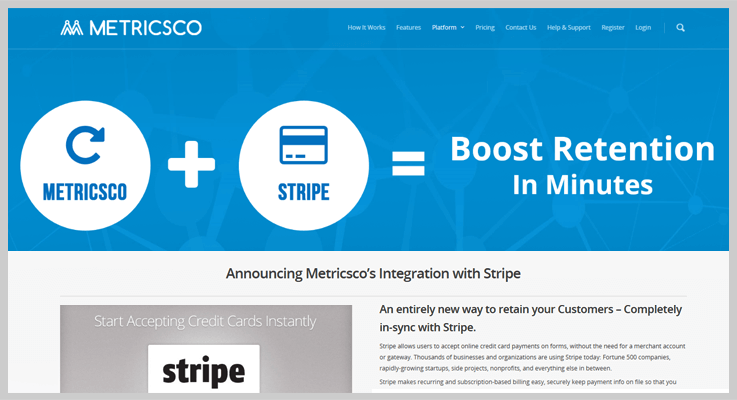 Metricsco has got different plans which are dedicatedly designed for Subscription Analytics, Subscription Optimization, Dunning Communication and Intelligent Payment Routing. Starter Plan (Pay As You Go):- Cost of this plan is $49, which comes with per 1,000 monthly unique subscriptions, 1 profile access, 1 payment service provider, email support and more. Professional Plan:- This plan will cost you $199 for a month. It can handle 10K monthly unique subscriptions, 10 user profiles, 50 pricing plans, 3 payment gateway, phone support, etc. Enterprise Plan:- It offers various unlimited features and Stripe analytics resources, for price details of this plan you have to contact the sales team. Helps you reduce churn rate as it automatically notifies and lists the details about customers who are about to leave the plans or those who are defaults in payments. Metricsco provides fully subscription analytics about new subscription, In-trails users, recurring sales, live subscriptions and more. Through dunning management, it helps you send custom messages to customers in case of card declined or payment failure. 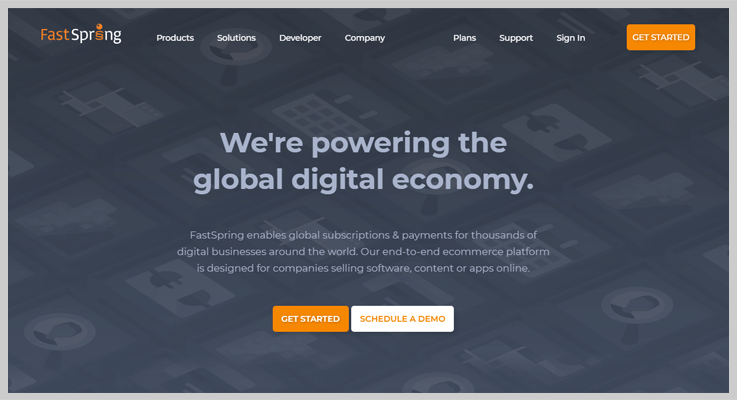 Fastspring is another subscription payment analytics tool with which you can design multiple price plans, create free as well as paid plans, step-up one-time payments and more. It is the most powerful and cost-effective tool that allows dunning management as well. Auto detects the customer’s location and helps you display the invoice language and pricing accordingly. Supports multiple payment methods, multi-currency support, and multi-language. Allows you to create free and paid trials, on-demand subscriptions, one-time setup fees and more. Pay As You Grow Plan:- 5.9% of the revenue collected and 95¢ per transaction will be charged in this plan. Business Plan:- Monthly plan cost $199, plus 5.9% of the revenue and 95¢ per transaction. Enterprise Plan:- For this plan price details, you have to contact the sales team. I definitely hope that this blog will help you get one which is the best form your business. try them once and I am sure that you won’t regret. In case, you have got any type of questions or queries, do let us know in the comments section below. We will be happy to hear from your side.